Not long ago the dental bridge was the alternative treatment of choice to partial dentures for restoring lost teeth. Over the last few decades, however, dental implants have nudged bridgework out of this premier spot. That doesn’t mean, though, that bridgework has gone the way of the horse and buggy. In fact, it may still be a solid restorative alternative to partial dentures for certain people. A traditional bridge consists of a series of porcelain crowns affixed to each other like pickets in a fence. The end crowns are fitted onto the teeth on either side of the empty tooth space; known as abutment teeth, they support the bridge. The crowns in the middle, known as pontics (from the French for “bridge”), replace the teeth that have been lost. 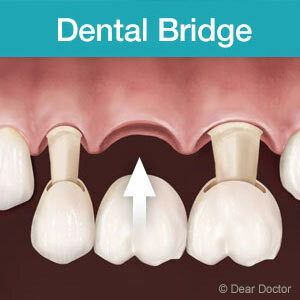 Bridges have been an effective and cosmetically pleasing method for tooth replacement for nearly a century. To achieve those results, though, a good portion of the abutment teeth’s structure must be removed to accommodate the crowns. This permanently alters these teeth, so they’ll require a restoration from that point on. Dental implants, on the other hand, can be installed in the missing space without impacting any neighboring teeth. What’s more, implants provide greater support to the underlying bone than can be achieved with bridgework. But not everyone is a viable candidate for implants, and ironically the reason most often has to do with the bone. If a patient has suffered significant bone volume loss, either because of disease or the long-term absence of the natural teeth, there may not be enough bone to properly support an implant. Unless we can adequately restore this lost bone volume through grafting, we’ll need to consider another type of restoration. That’s where bridgework could be a viable option for patients in this or similar situations. With continuing advances in materials and new applications, the traditional bridge still remains an effective and important means to restore a smile marred by missing teeth. Your smile is healthy, but you'd like to improve its appearance. Could you change your tooth color or even your smile alignment? At Glen Ridge Dental Arts in Glen Ridge, NJ, and serving Montclair, Dr. Paul Dionne will deliver the look that best compliments your facial structure and meets your smile goals, too. The American Academy of Cosmetic Dentistry encourages patients to think carefully about the end result. In other words, how do you realistically want your teeth and gums to improve? Together, you and Dr. Dionne will work out a smile makeover as simple or intricate as your budget and preferences allow. With his extensive training with the Spear Study Club, Pankey Institute and other continuing education venues, he's ready to deliver the smile of your dreams. At Glen Ridge Dental Arts, expect a healthy, renewed smile that fulfills your every expectation. Dr. Dionne and his staff will guide you through every step of your smile makeover, maximizing your comfort and satisfaction. Call today for any questions about cosmetic dentistry or for a consultation in Glen Ridge, NJ, and serving Montclair at (973) 748-7790.